Ao Nang is only a small town and usually, it only takes half an hour to stroll the entire place. However, this is one of Krabi’s tourist centers, with its pristine beaches, laid-back homey feeling and the friendliness of the locals that all increase the appeal of the place. If traveled by land, it only takes 20 minutes from Krabi town or a couple of minutes from Noppharat Thara. You can also travel by boat from Railay beaches. But, what are the common activities present in this place? There are plenty of activities to enjoy in Ao Nang such as Thai massage, island hopping, jungle trekking and other aquatic adventures. If you want to explore the islands and communicate with its unspoilt nature, you can do island hopping by renting a longtail boat. There are over 200 islands along the Andaman coastline, which can be an endless exploration for you. Of course, getting around Krabi can be a taxing activity so it’s best to unwind and relax with Thai massage. There are plenty of massage salas or open-sided huts on the south portion of the beach. For 200 baht per hour, you can definitely relax and release those stress deep inside. Open-air spas are also present and offer many services including rejuvenating treatments and herbal spa. Trying out different dining places is one of the best things to do in Ao Nang and the best part is that there is wide healthy range of foods to choose from. Pick the foods you prefer, from Thai, Italian, Mexican or Chinese foods: these are all available in town. Majority of restaurants are serving tasty seafood dishes and genuine Thai cuisine. Another advantage is that you can reach these restaurants in just a short walk and there’s plenty to see and try that fit your budget and taste. Yet, another famous activity in the town is jungle trekking together with the gentle giants – that is, the elephants. Elephant trekking in the deepest jungles and virgin rainforests can be an unforgettable experience, but be sure to book beforehand and choose which program to join. Each program has a different activity schedule, some of which include elephant ride, swimming and relaxation on jungle rivers and nature trekking by foot. Besides swimming, there are many fun aquatic adventures to look up when visiting Ao Nang. You can pick a number of kayaking package, with a number of activities including sea kayak on few deserted beaches in Koh Hong and Ao Thalane. 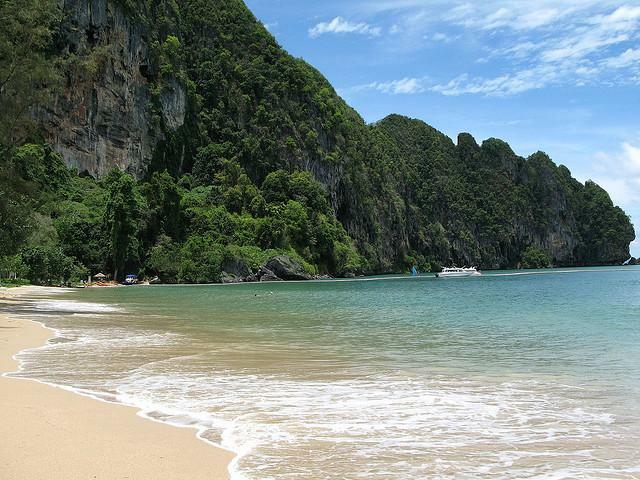 When going to Koh Hong, you can explore caves through narrow tunnels and the white sand beaches and shallow water. Situated at the center of Krabi mangrove ecopark, kayaking in Ao Thalane allows you to enter karsts, beautiful caverns and swamps with lagoon. Other activities are snorkeling and scuba diving. The ideal time to do snorkeling is during low season where the beach isn’t too busy while the best time to do scuba diving is during November to April because the rainy season starts from May to October, which may cause reduced diving visibility.